KidsEBookBestsellers.com: The Kissing Hand Shot Straight to the Top in E-Format! The Kissing Hand Shot Straight to the Top in E-Format! The Kissing Hand by Audrey Penn was on the Kids' EBook Bestseller List for three weeks in a row in late August and early September. Audrey's book reached the number 3 spot, the number 2 spot, and yes, the number ONE spot in the Kids' section of the Barnes and Noble Nook store. Let's hear all about it. The Kissing Hand is a book about Chester Raccoon who is about to start school and is suffering from separation anxiety from his mother Mrs. Raccoon. 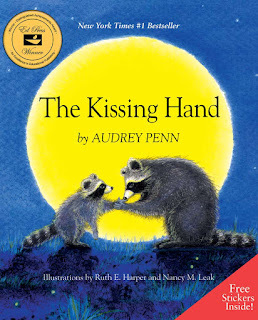 To help her tiny cub, Mrs. Raccoon tells him the story of The Kissing Hand and kisses the center of his palm. She tells him that whenever he feels lonely and needs a little loving from home, just press his hand to his cheek and think, “Mommy loves you.” On the way to night school, Chester Raccoon surprises his mother with a Kissing Hand of her own. My path to publication was very unconventional and unusual, to say the least; but not less difficult once getting started. I wrote a manuscript as a Christmas gift for the actors, dancers, backstage geniuses, teachers, and friends involved in my theater career in New York and Washington, D.C. in the later 1960’s. In 1970 I received a phone call that a publisher wanted to publisher my book. I asked them what book and they thought they had the wrong number. They asked my name and told me the name of the book, which just happened to be the name of my manuscript. To this day, I have no idea who sent it in. No one has ever come forth. The name of the book is Happy Apple Told Me. I truly believe that the subject matter of The Kissing Hand and its leading characters is the reason it has become the popular book, and now e-book, that it has become. Separation anxiety is a problem, not just for very young child, but for children of all ages and for many adults. It is not just the little ones who suffer from separation when they are dropped off at school; it is very often the parent. It was for me. My target audience was originally set for children ages five through eight but has proven to be appropriate for everyone from newborns to youngsters leaving for college. Most children are introduced to my books when they first enter school when they hear The Kissing Hand, but several books, such as Chester Raccoon and The Big Bad Bully and A Kiss Goodbye carry them through the fourth grade or older. I believe that my book Chester Raccoon and The Acorn Full of Memories in which Mrs. Raccoon helps Chester and the forest of young animals deal with the death of a schoolmate should be in every school, home, library, nook, kindle, and funeral home in the country. It is enormously gentle and helpful to begin a discussion between an adult and a child about death and making memories. I was initially against all e-books when it came to children’s books. Children are already too tied to e-games, e-movies, and the cyber world as a whole. All children deserve to know the feeling of making a best friend that lives between the pages of a book that he or she can run to at any time and know that they will be there no matter what to comfort them, entertain them, and secure them into knowing that some things will always stay the same. A book is forever and there is nothing like the artwork and the phrasing in the big pages of a children’s book where the drawings are in proportion to the big people across the room. But.., teachers and students have recently made me aware that children who were once non-readers have become avid readers because of e-books, and that literacy has increased greatly because of e-books as well. If this is the case, I think it is wonderful. As for hearing myself read the nook version of the book; that pleases me. To learn more about Audrey Penn and her books (The Kissing Hand is part of a series) visit her website.